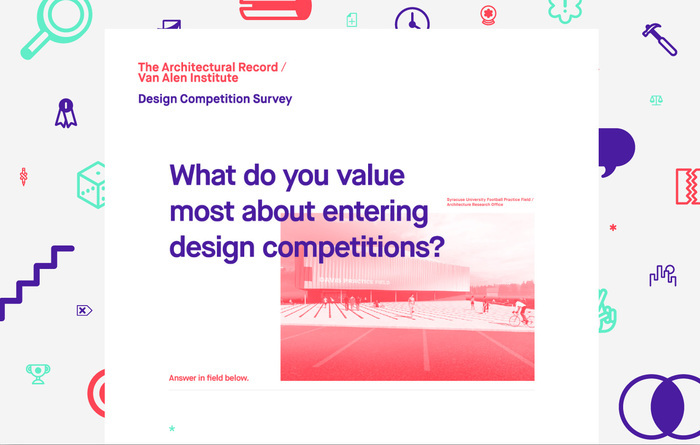 The Architectural Record / Van Alen Institute Design Competition Survey, 2015, New York. Courtesy of Bruce Mau Design. 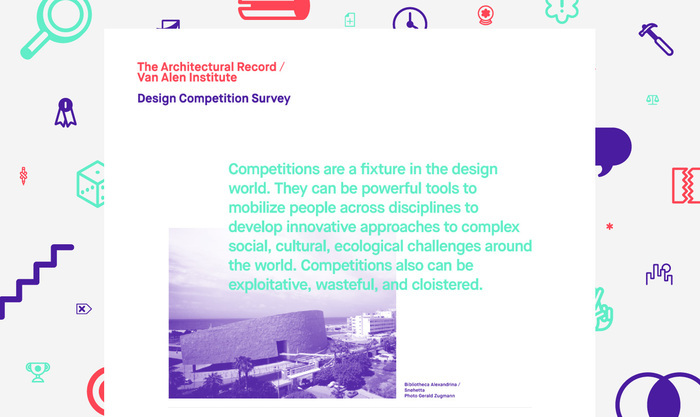 Competitions are a fixture in the design world. They can be powerful tools to mobilize people across disciplines to develop innovative approaches to complex social, cultural, and ecological challenges around the world. Competitions also can be exploitative, wasteful, and cloistered. Rethinking the Design Competition: The Architectural Record/Van Alen Institute Competition Survey gathers input on what motivates designers to enter competitions, what they love and hate about the process, and their suggestions for how to make them work better. The survey results help catalyze the development of new models for this highly charged element within the profession. 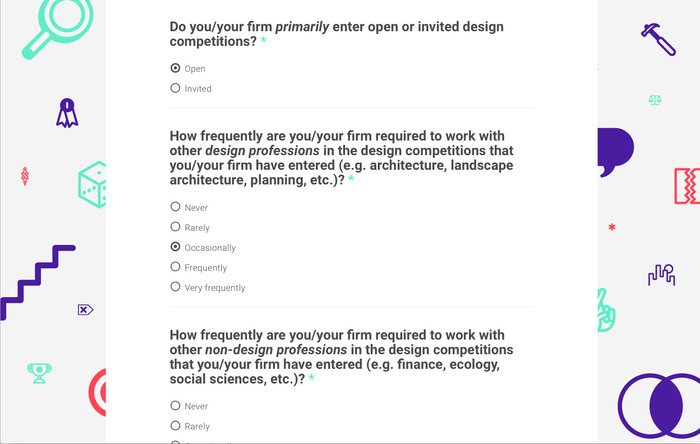 The survey results were made public at the Design Competition Conference co-hosted by Van Alen Institute and Harvard University's Graduate School of Design, April 23–24, 2015. David van der Leer specializes in the contemporary urban condition and creates programs that address urban issues through dialogue, research, and experiential installations. Prior to joining Van Alen in 2013, he spent five years at the Guggenheim Museum, where he took programs out of the gallery context and into the city as curator for the BMW Guggenheim Lab and associate curator for Architecture and Urban Studies. He also curated And then it became a city..., a video-based exhibition at the 2011 Shenzhen Bi-City Biennale of Urbanism/Architecture and the video component for the US Pavilion at the 2012 Venice Architecture Biennale. Jerome Chou is an urban planner, landscape architect, and community organizer. He has worked at Flint Public Art Project, where he developed dozens of temporary installations, events, and workshops in partnership with residents in Flint, Michigan; and at the Design Trust for Public Space, where he led projects to retain garment factories in Midtown Manhattan and to expand urban agriculture throughout New York City. He also has worked for the landscape architecture and urban design firm James Corner Field Operations; the Baltimore City Planning Department; the community organization, ACORN; and the nonprofit book publisher, the New Press. Essential to the profession for more than 110 years, Architectural Record provides a compelling editorial mix of design ideas and trends, building science, business and professional strategies, exploration of key issues, news products, and computer-aided practice. At Van Alen Institute, we believe design can transform cities, landscapes, and regions to improve people's lives. We collaborate with communities, scholars, policymakers, and professionals on local and global initiatives that rigorously investigate the most pressing social, cultural, and ecological challenges of tomorrow. 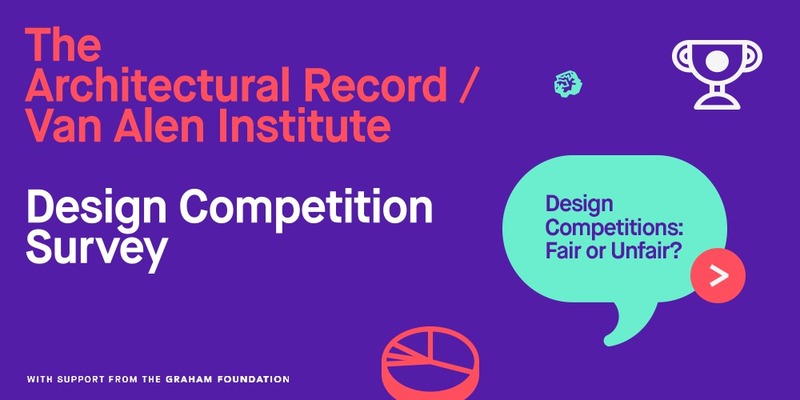 Building on more than a century of experience since our founding in 1894, we develop crossdisciplinary research, provocative public programs, and inventive design competitions.